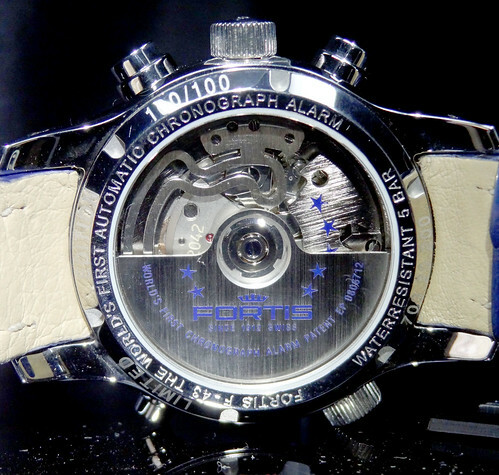 In 1998, Fortis produced the worlds 1st self-winding watch with not only a chronograph, but also a mechanical alarm. The extremely complicated movement was inspired by space specialists at the Star City Space Training Centre in Moscow. These complications were required by cosmonauts as they would prove to be extremely useful in space missions. As I’m sure you could imagine, a stop watch and a gentle reminder could prove useful in everyday life, let alone space travel. The development of this movement has tremendously progressed over the years. Taking the 380 part movement with duration for space travel, improving it by adding COSC certification, and now today, adding even more complication! 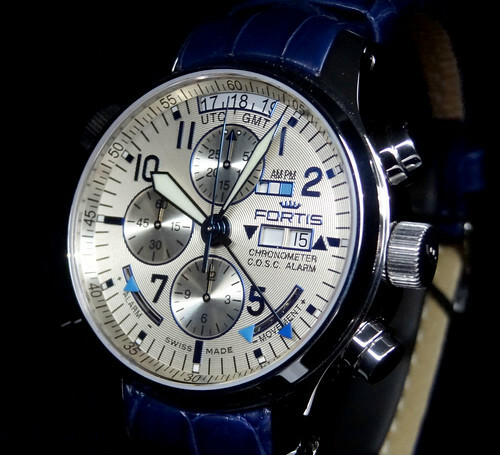 This year, Fortis has introduced the 1st Chronograph Alarm with GMT and Dual Power Reserve. 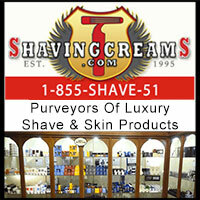 On top of all that, it is COSC certified for the finest accuracy. To accomplish COSC certification with so much complication is extremely difficult. There are over 500 parts in this movement. That’s more than you will find in most Patek Grand Complications! Needless to say… there is a lot of time & dedication in building these pieces. For all the different features this watch has to offer, the dial is surprisingly very legible. The GMT time is located at 12 o’clock and is adjusted by a separate crown at 10 o’clock. 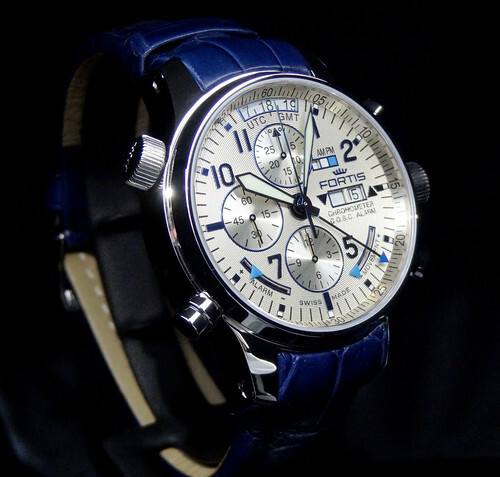 The chronograph is operated and read like most, by the pushers at 2 and 4 o’clock, with the hour counter display just above 6 and the minutes counter just below 12. 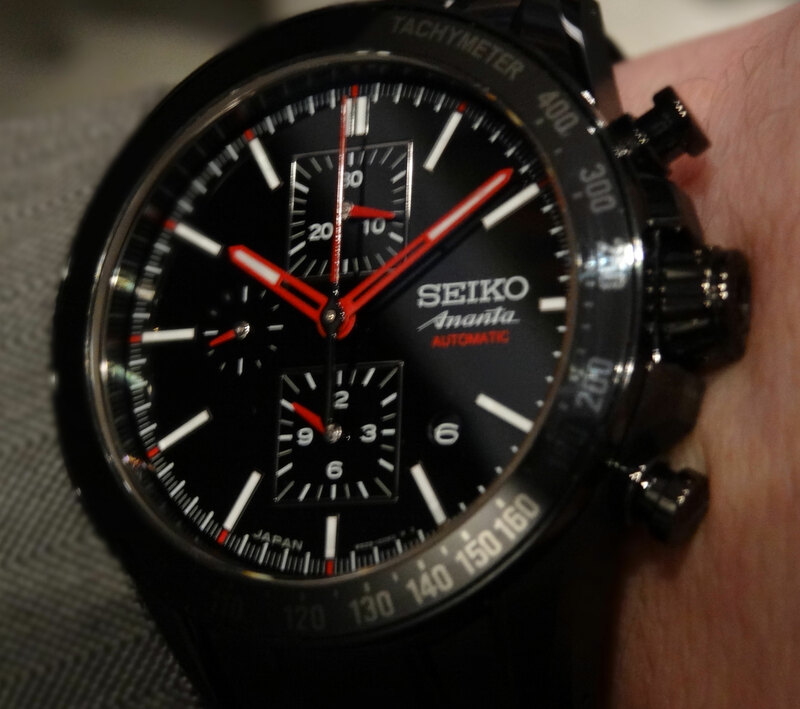 The chronograph second hand is central and the continuously running second display is just inside 9. There’s also an AM/PM indicator just between 1 and 2, with the date at 3 and the alarm “ON/OFF” indicator just beside it. As if this isn’t enough, there are two power reserve displays. One located between 5 and 6 for the actual time keeping movement and another between 7 and 8 to display the power for the separate barrel that drives the alarm. The watch is very easy to function. The crown at the 1st position will manually wind the watch (which winds the movement mainspring 1st, then the alarm spring). On the 2nd click out, turning the crown counter-clockwise will adjust the date while turning it clockwise sets the alarm hand. The alarm can be turned on or off by pushing the pusher at 8 o’clock and is indicated “ON” when the box next to the date turns blue. If it is off, the box is white. The 3rd click out is setting the time. 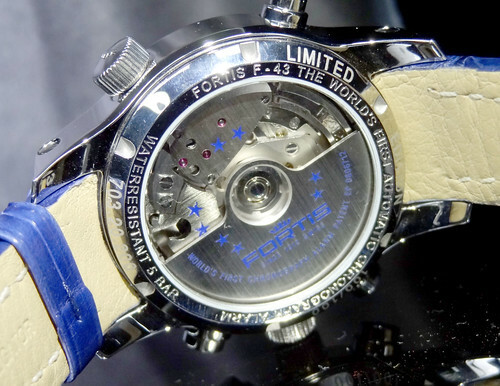 The caliber that runs this piece has been labeled the F2012, a Fortis proprietary. It consists of 39 jewels, beats at 28,800bph and has a premium Incabloc shock absorber. While it is a mouthful to explain how the watch operates, I hope it helps to understand the true attention to detail and convenience. The piece is incredibly functional and easy to operate, especially considering the level of complication. Many complicated pieces can be incredibly difficult to set, which is one of the many reasons I admire this watch so much. The 2 piece cases finish is very high quality. 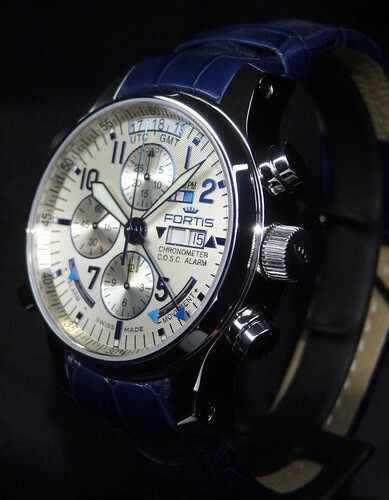 While most are used to seeing a bead blasted or matte finish from Fortis, the new F-43 comes in an incredible high polish. I’ve had the opportunity to handle many amazing timepieces, and this finish definitely stood out. While a pictures is worth 1,000 words, it is far more impressive in person. 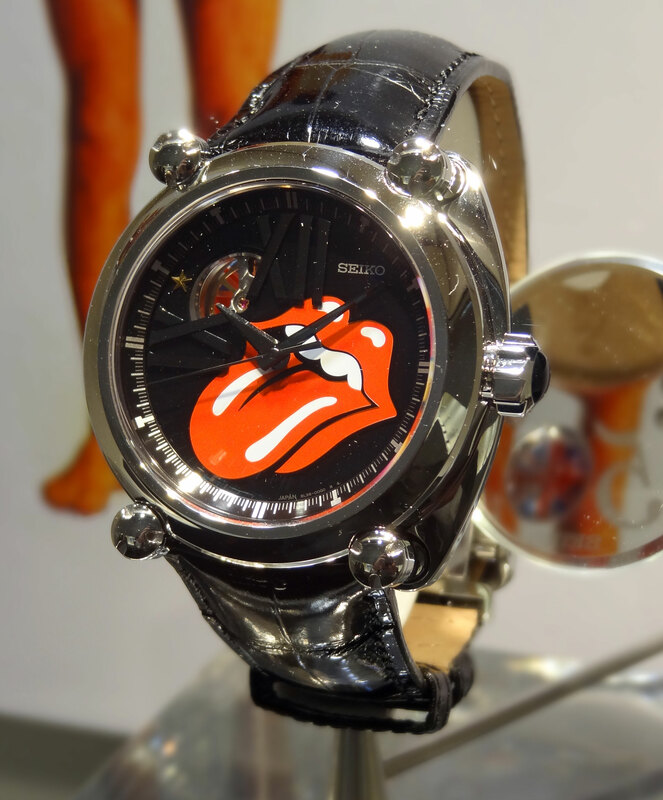 The watch is 43mm wide and is about 16mm thick. It has to be thick, for such a complicated movement, but surprisingly wears very well. 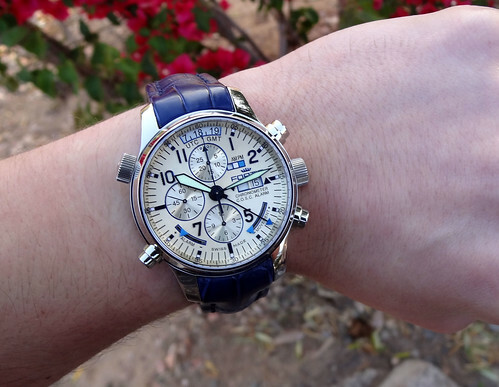 It may not be the best under the cuff, but wears very comfortable and looks great on the wrist. I’m a big fan of the blue and white color combination. 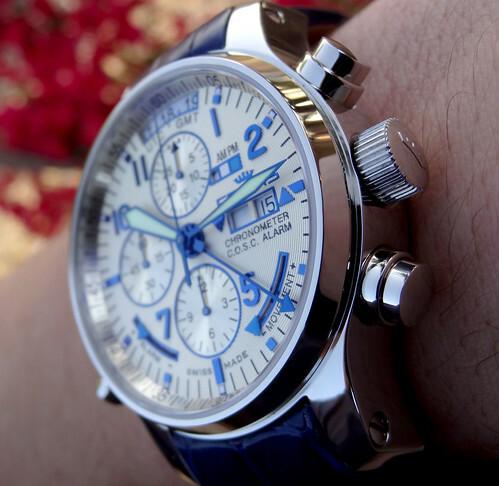 The blue steel numerals and blue strap really compliment the opaline/silver color of the dial. It is slightly metallic and has a recessed circular pattern to it. The detail is incredible. The dual coated Anti-Relective Sapphire Crystal also adds a nice blue tint in high light. I really enjoy the alarm complication. I’ve included a video to show how it works/sounds. 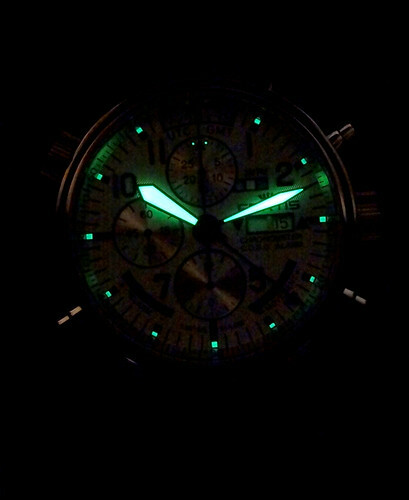 The buzzing of the alarm is followed by a quick performance of the chronograph, to show how smooth it operates. 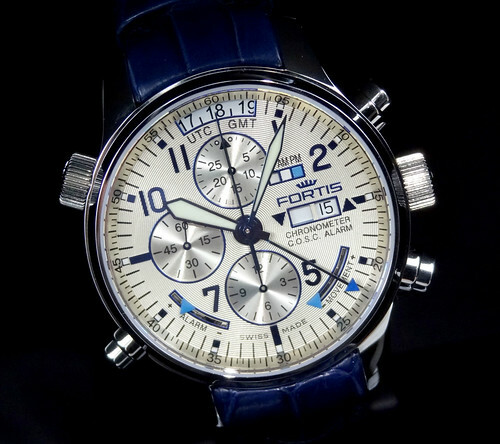 The Fortis Alarm Chronograph GMT is retailing at $20,850 and will be limited to only 100 pieces world wide. Here at Arizona Fine Time, we were fortunate enough to receive number 100 out of 100. A truly collectible number. As always, please let me know if there’s ever any help I can be. 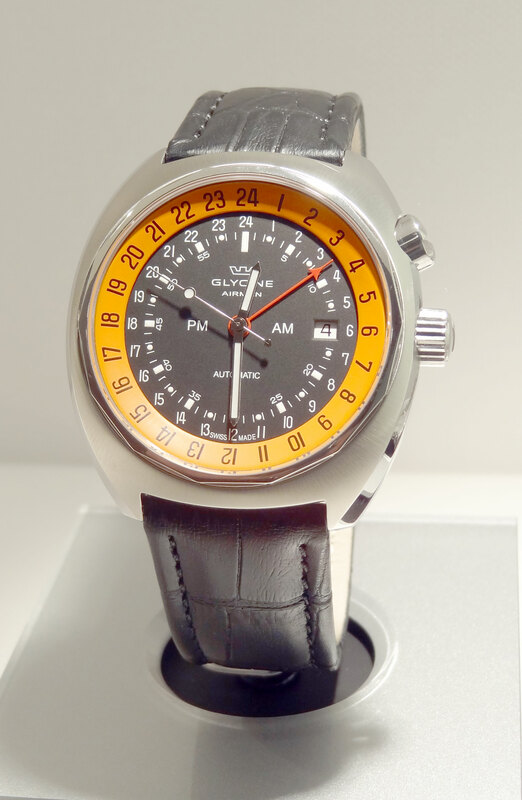 Glycine is a brand that AZ Fine Time has carried for years. Aside from the great designs and movements, they are a fantastic price point. 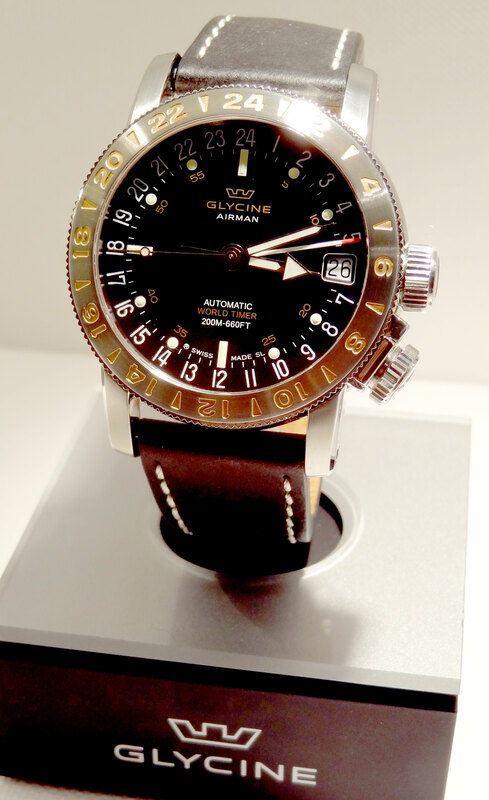 Glycine’s tradition lies in “Airman” pilots type watches. 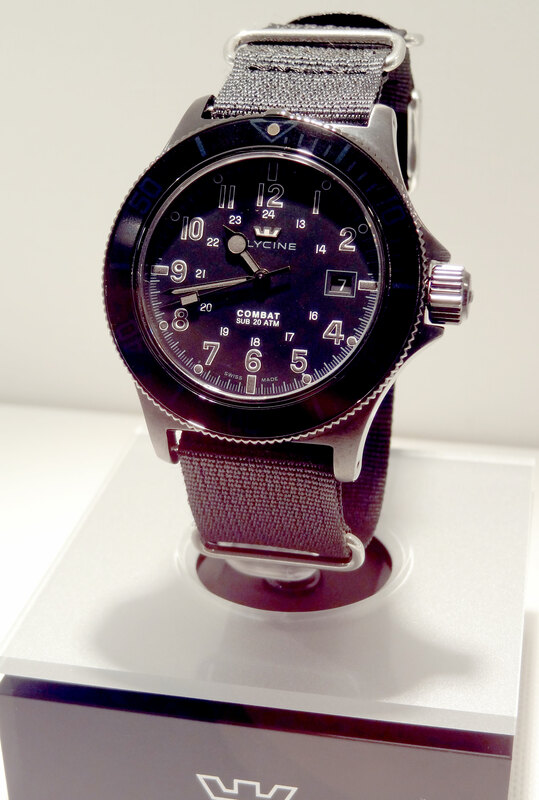 Very popular for US pilots during WWII, Glycine’s Airman series is still one of the most popular items around today. Purist type watches (only counting in 24 hour increments) are extremely popular for us in this brand. The new Airman SST 12 3903 (in 3 new variations) are going to be huge hit! The steel back will have a silhouette of its namesake, the Boeing Super Sonic Transport. The Airman 17 and 18 are also going to be available in some new styles. 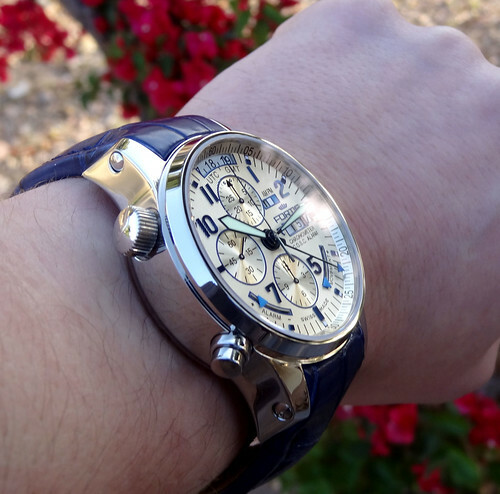 There will be the regular Airman 18/17 with Rose Gold accents on the bezel and dial. There will also be the addition of the “Royal”, which will have an 18kt Rose Gold bezel. Another huge hit this year is going to be the new variations of the Combat Sub Automatic. The new “special” series this year will incorporate the new models the Stealth, Golden Eye, and 2 dual tone variations. The quality for the money is definitely hard to beat, but the designs this year are very cool. I’ll be looking forward to their arrival at AZFT! 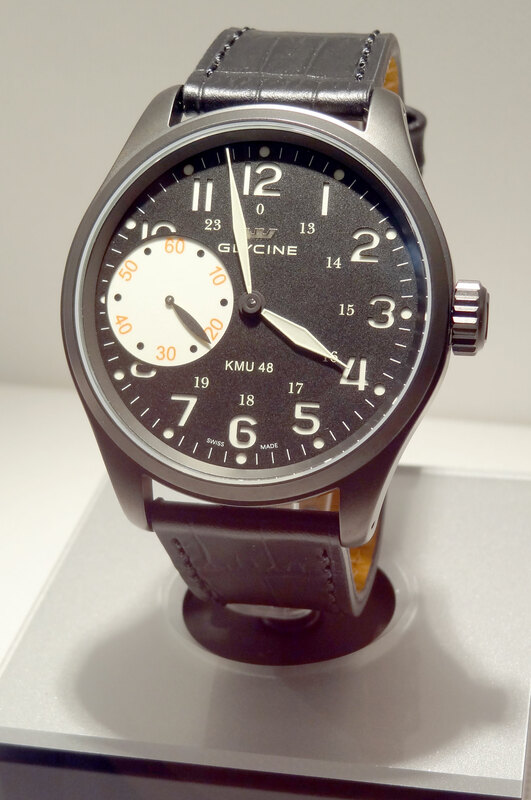 Glycine Combat Sub Special "Stealth"
Fans of the KMU48 will be very excited this year. There are 2 new releases on the horizon. The manual wind 48mm classic is going to be available in the next few months and will still be a great value from Glycine. 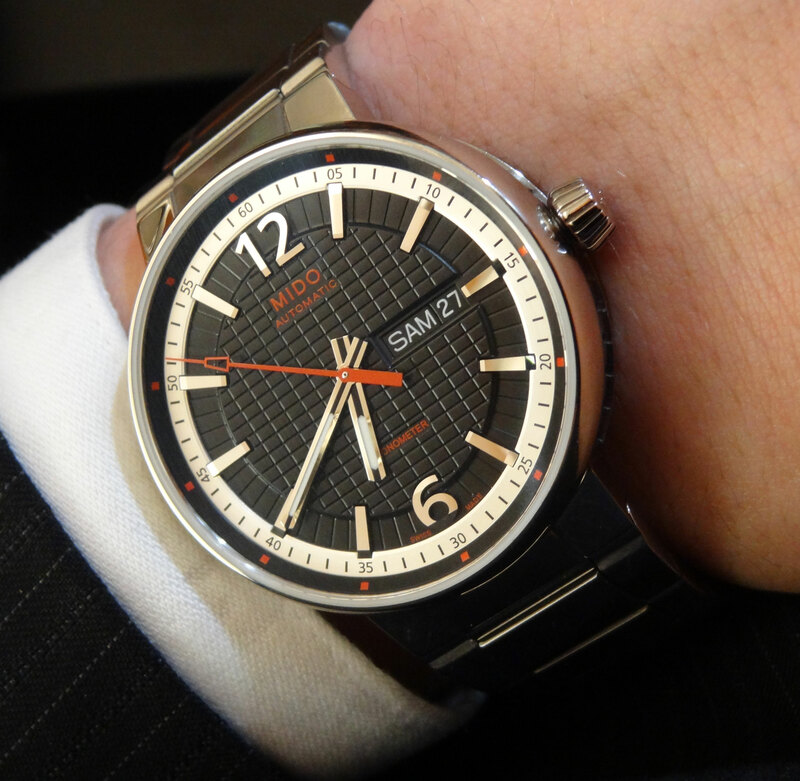 Please click below to see all the images we have from Glycine! Mido’s booth at the Basel Fair was booming this year. Being one of the finest quality ETA based movements for the price certainly has its perks. 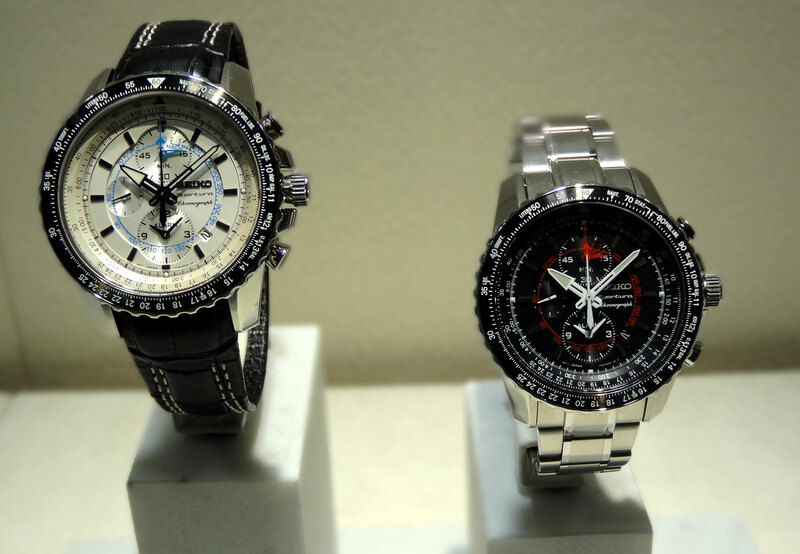 The brand is owned by Swatch Group (who also owns Omega, Breguet, Hamilton and many others). 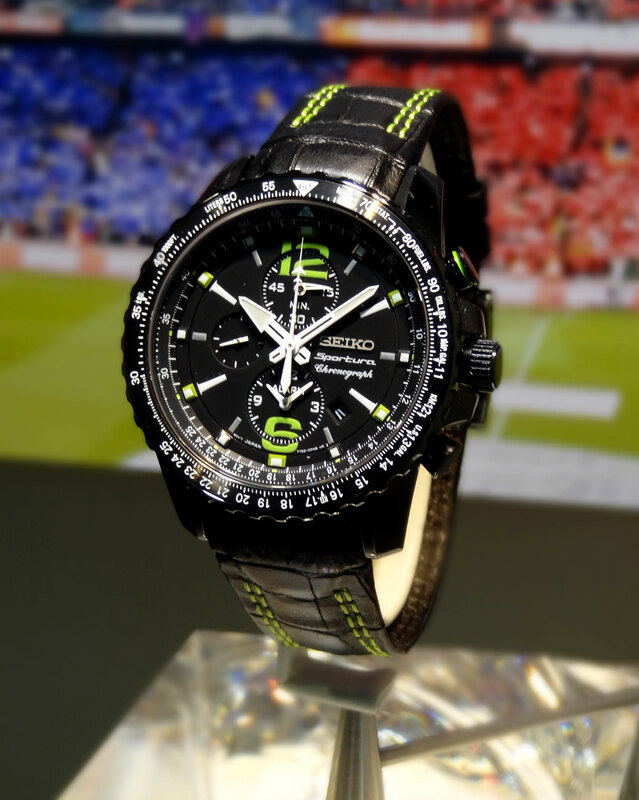 They also own ETA movement manufacturing which gives Mido the ability to be at such a fantastic quality for the money. 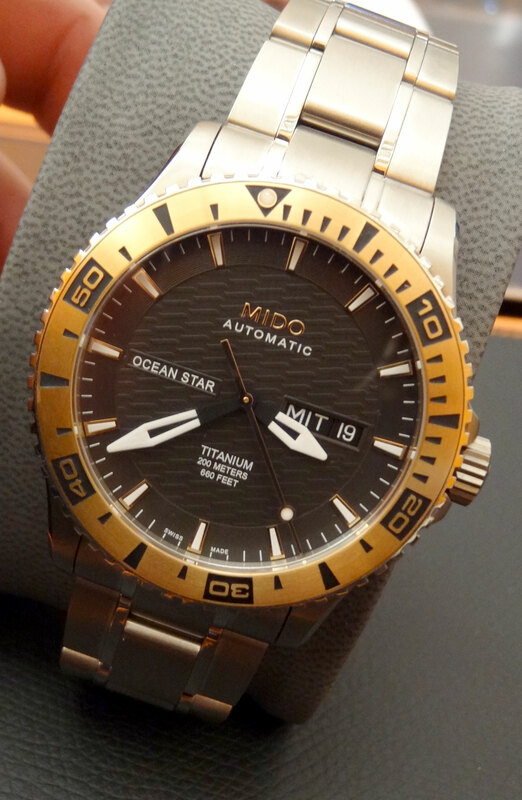 This year, Mido’s new releases were some of the best looking collections you could ask for. To kick it off, the very popular Ocean Star Captain IV is now coming in Titanium in 2 different styles, one with a rose gold bezel and one with the titanium finish. Mido’s Multifort series took serious expansion with an addition of many new pieces. 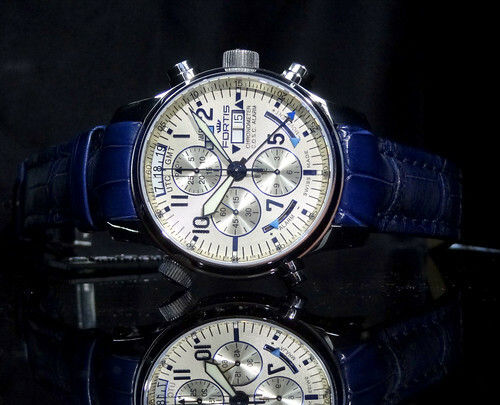 Everything from Chronographs to a new power reserve model all looked outstanding. The success with last years black and orange special edition inspired some great looking new black and red models, as well as a new brown and gold variation. 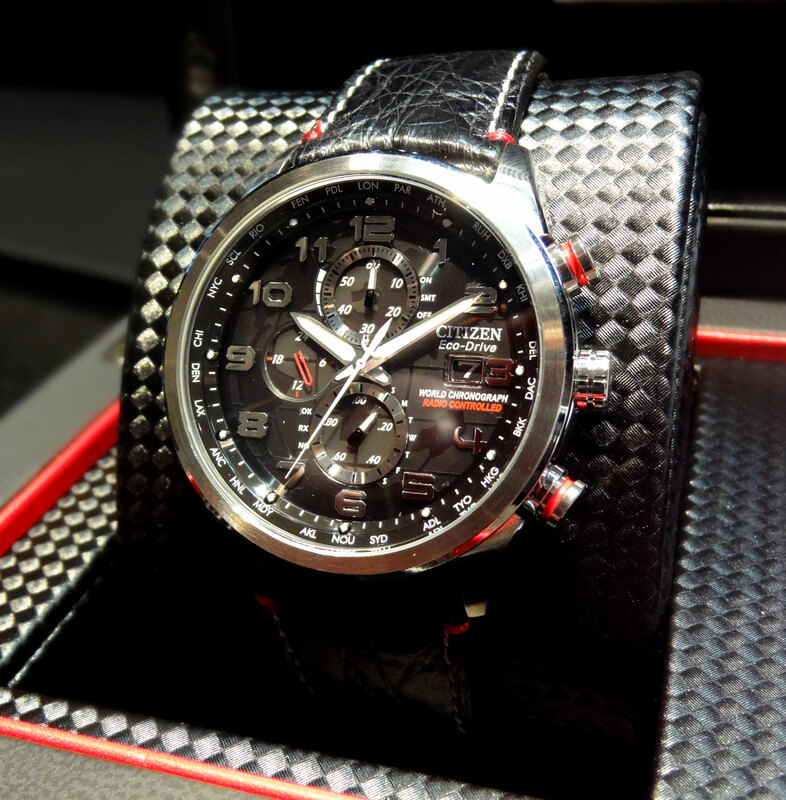 The new black and red Multifort auto with power reserve display should also win many new fans of the brand. 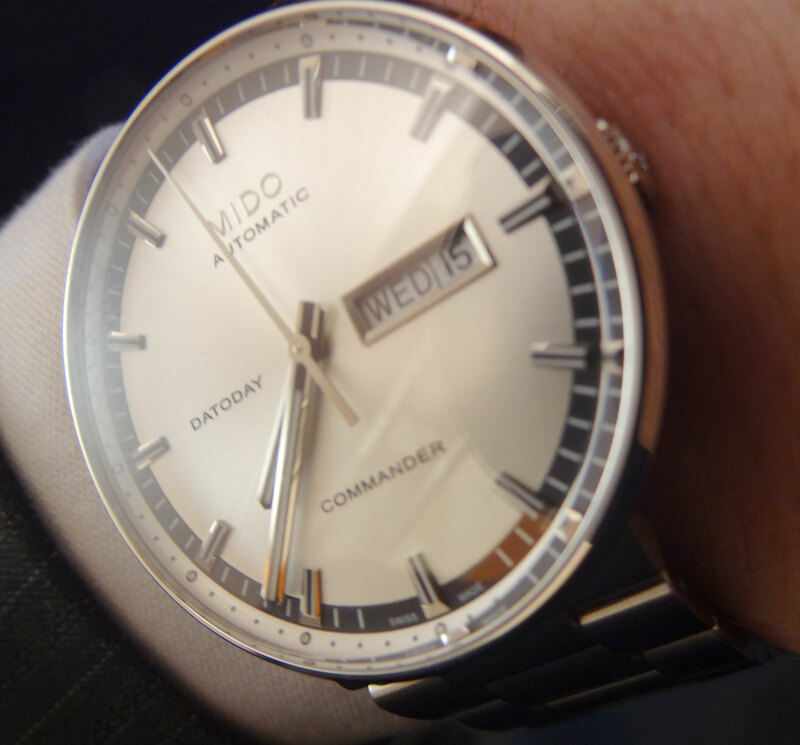 For the 1st time, the Mido Commander series has introduced a new series, in a large size with a new design. 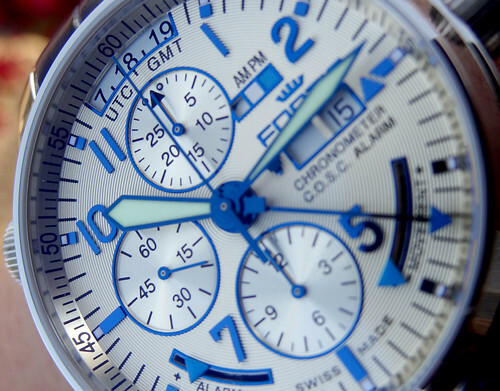 This new Commander will be coming in both Certified Chronometers, and non-Chronometer models. This brings a new element to a historic watch and will give anyone with a preference for a large case size the opportunity to add a Commander to their collection. 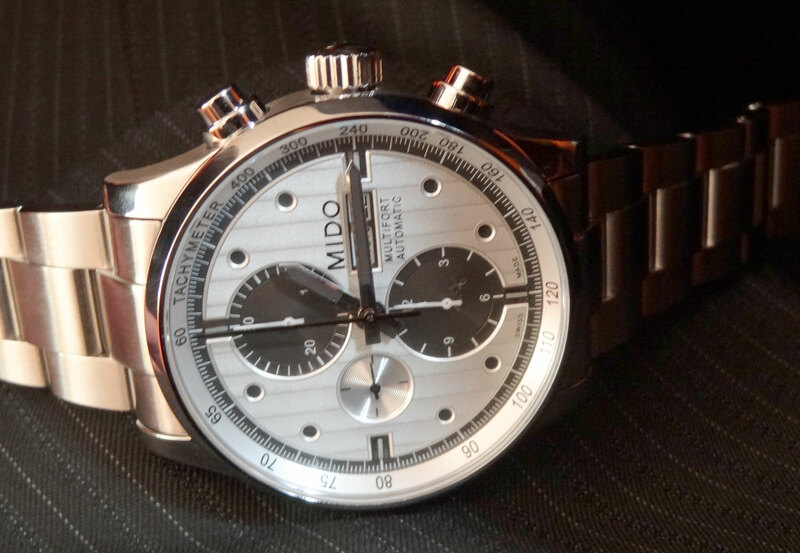 A new Limited Edition All Dial Chronometer will also be added to the Mido collection. 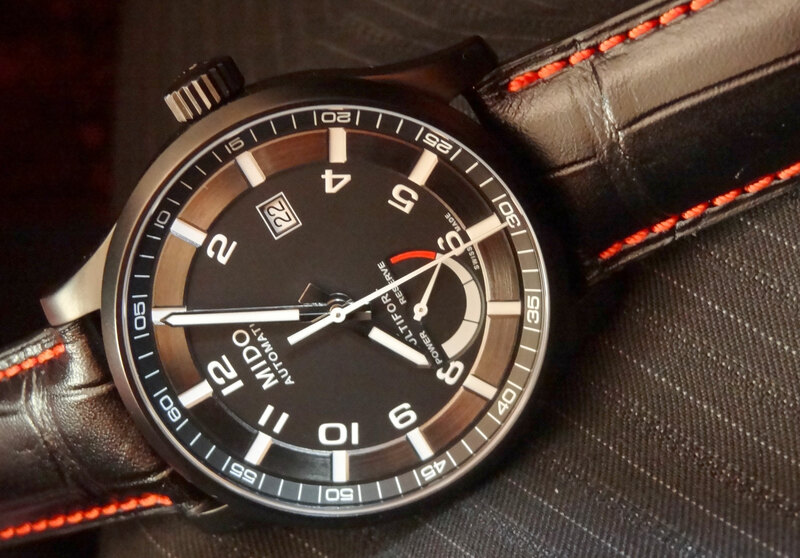 The new LE will have an Anthracite dial with orange accents and come on a stainless steel bracelet. The case back will be closed with an engraving of the Colosseum which inspired the design. 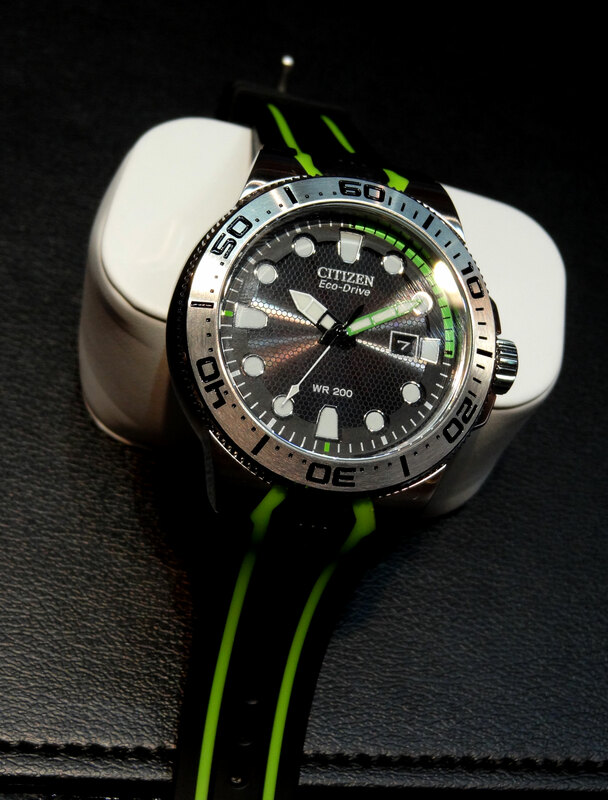 A completely new series has also been added to Mido this year labeled “Great Wall”. 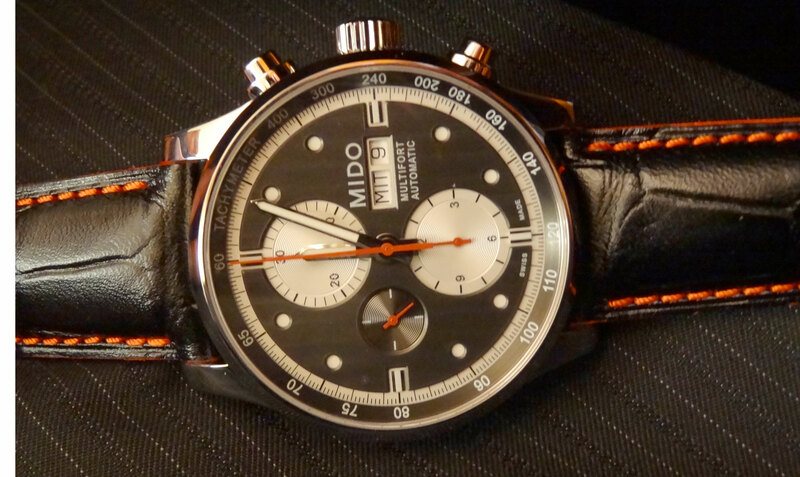 The name and design were inspired by one of the leading markets for Mido watches famous land marks, China’s Great Wall. 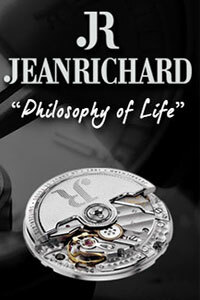 The pieces will come in both 42mm and 38mm and will all be Certified Chronometers. 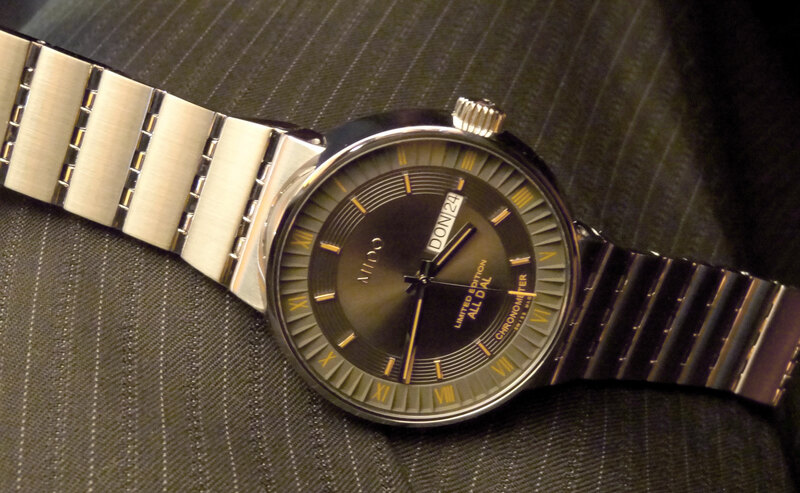 I was truly impressed with this new collection and foresee it becoming one of Mido’s leading series. 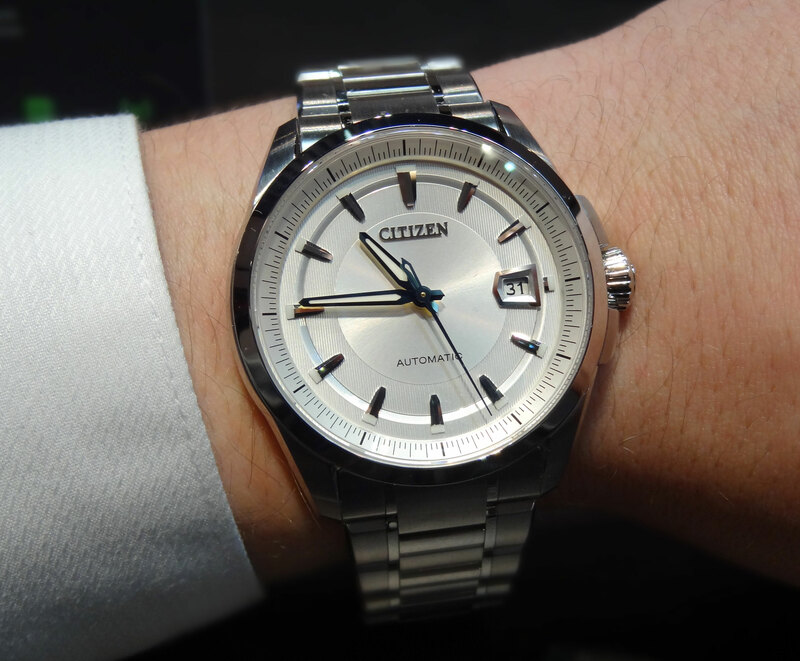 Citizen had many exciting releases this year at the Basel Fair. Technology is key with many new variations of releases for the global market, as well as some very intriguing concept models. 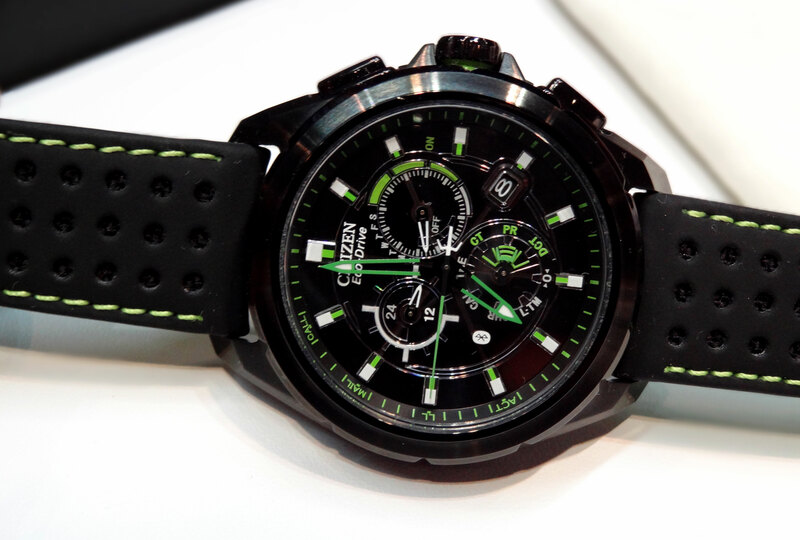 The Citizen Eco-Drive Nova is a new concept model for 2012 where light rises from within the watch, in an incredibly unique and dazzling display of time. While I cannot explain quite how to read the watch, the dial is made to mimic the look of “breathing” city lights as seen from the sky. 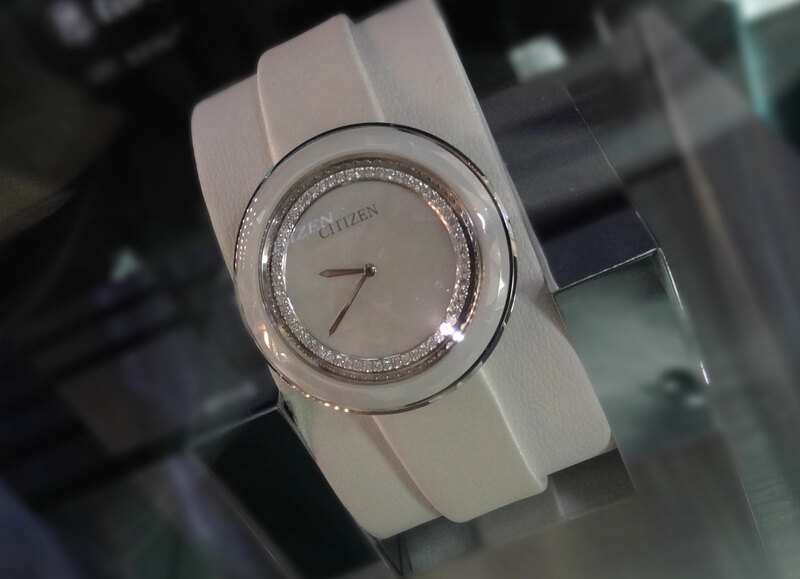 The new Concept, Citizen Eco-Drive Luna, also utilizes sparkling light in a unique display. 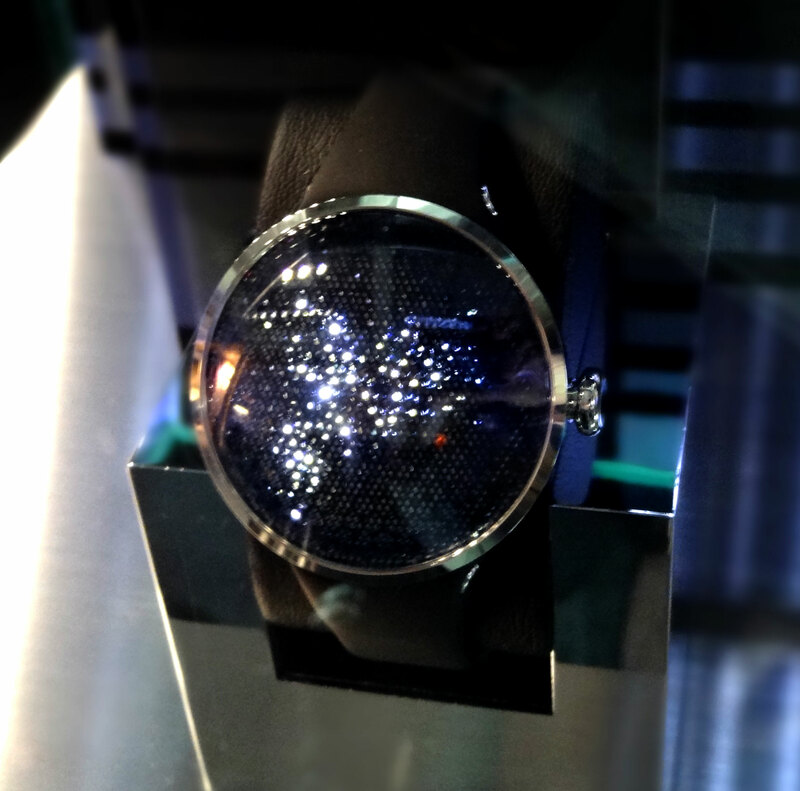 There are 60 diamonds that light up with each passing second giving the watch a distinct and unique feel. These models, being concepts, will probably have no chance to hit retail shelves, but are very impressive to see. 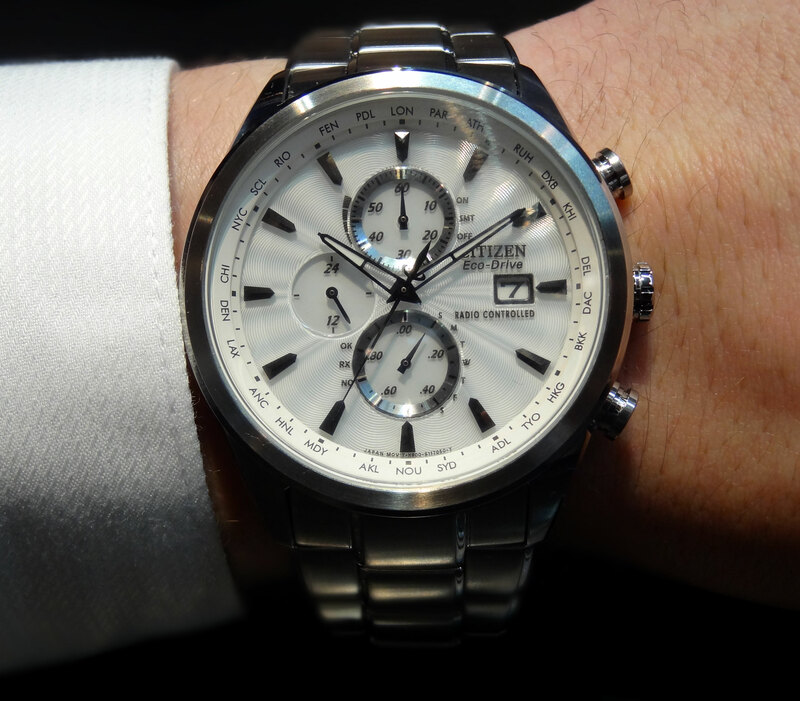 The Citizen Eco-Drive Proximity is a very cool release that has incorporated Bluetooth technology into your wrist watch. The basic concept is that you sync the phone to your watch (will only be available with iphone 4s or higher). The watch will notify you when your phone is ringing by a slight vibration on your wrist. You will also be able to ignore calls should the phone ring and you are not free to answer. The watch will not only be able to update you on incoming phone calls, but also email, missed calls, SMS texts and if your phone is too far away from the watch to receive updates. There will also be an iPhone app to upgrade the Bluetooth technology. The new movement is the Caliber W760 and also includes perpetual calendar, 60 min chronograph, power reserve, 24 indicator, and AM/PM indicator. 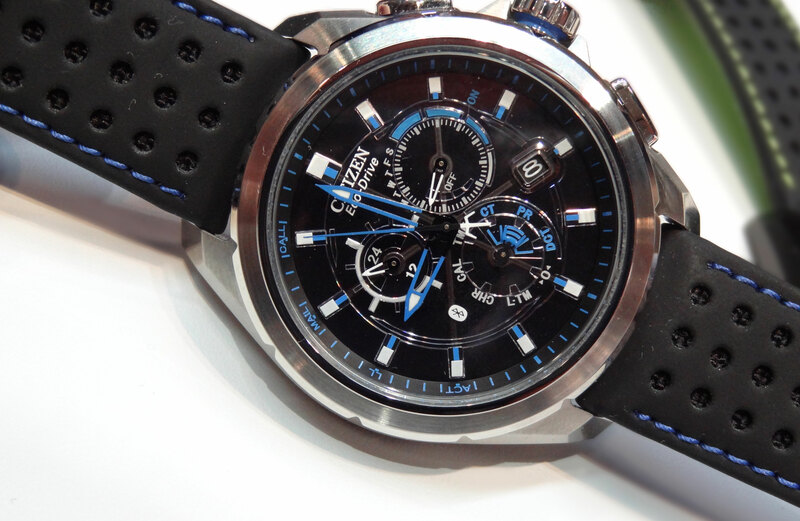 New for the Citizen Signature series comes the 1st automatic watch to come to the US. The Miyota based caliber is outstanding not only in finish, but also in operation. The rotor swings better than most automatics I have ever seen. I am really looking forward to putting them to the test as I am confident the performance will be outstanding. The design is new to the signature collection and truly beautiful and classic. There will be 3 new variations at an unbelievable price point. 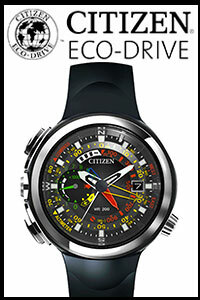 Citizen Eco-Drives core line-up has added some amazing pieces to the collection at unbeatable price points. 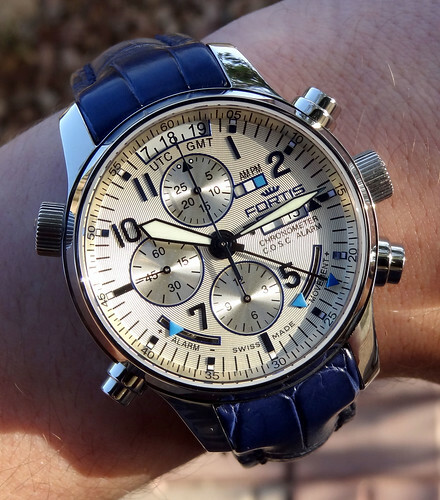 Adding new Radio Controlled Chronographs, new variations of the Blue Angles series, and some great new divers; Citizen will be killer this year. 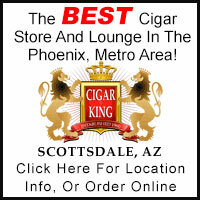 Can’t wait to get all these great new releases here at AZ Fine Time! What a long journey it has been. After 20 hours of travel and very little time to rest, we made it to the Basel Fair. Switzerland is beautiful and the people here are extremely friendly, but we are here to see some great watches. Believe me when I say, there are PLENTY here. 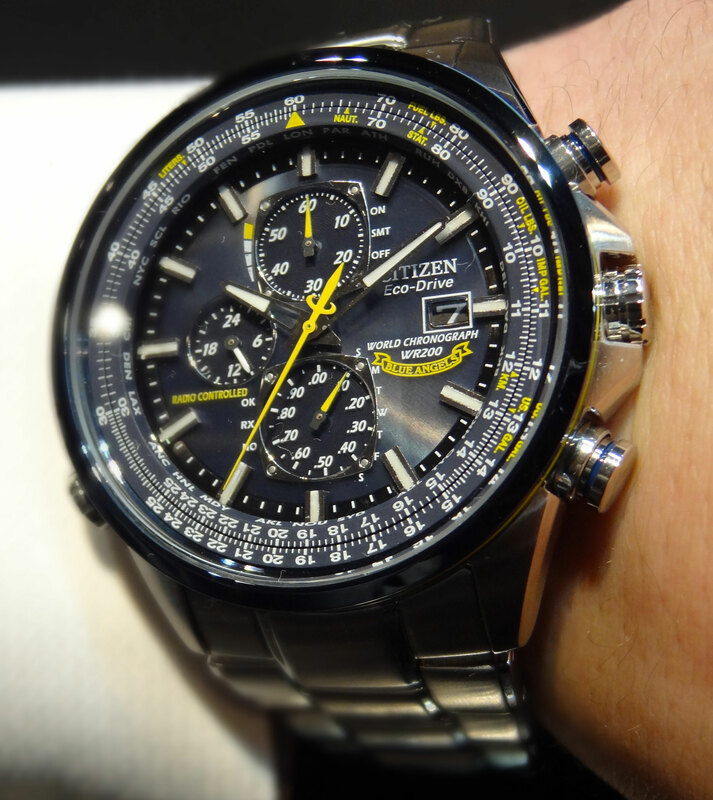 We spent a lot of time in Seiko’s booth examining the new releases. 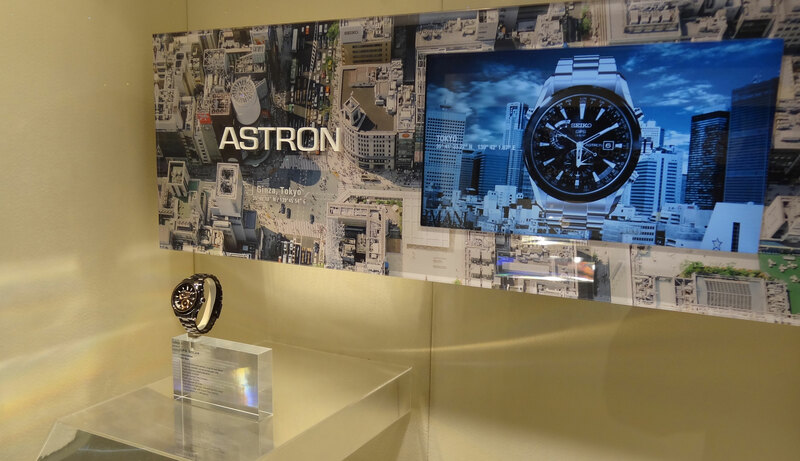 There were many impressive items to come out, but the highlight of the show was the new Astron GPS. This model is going to be extremely limited production, with a couple of variations being exclusive to AZFT. This is the 1st watch in the world that will not only update its accuracy by using GPS satellites (up to 4 of them), but also adjusts the date automatically, and most importantly, the time to what current city you are in at the push of one button. It can take anywhere from 6-30 seconds to update, but this is one of the most convenient watches for travel ever produced! 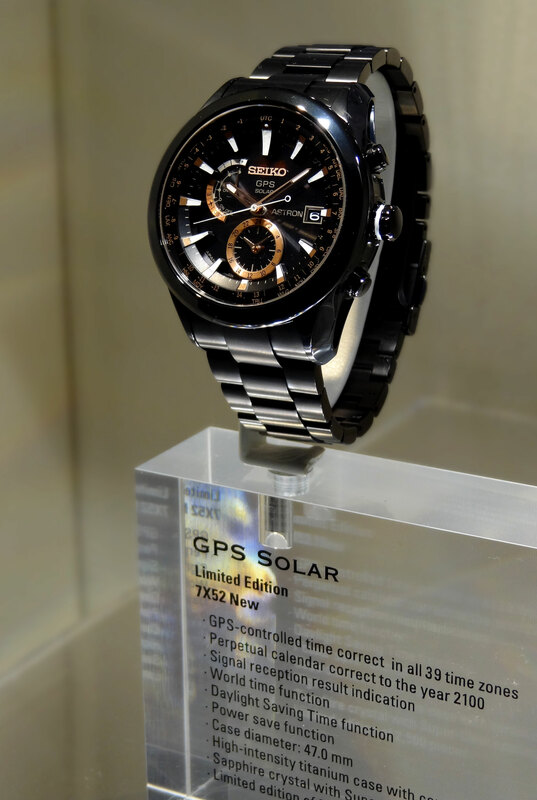 Seiko Quartz Astron GPS Solar SAST001, SAST003, SAST009 will definitely be coming to the US. 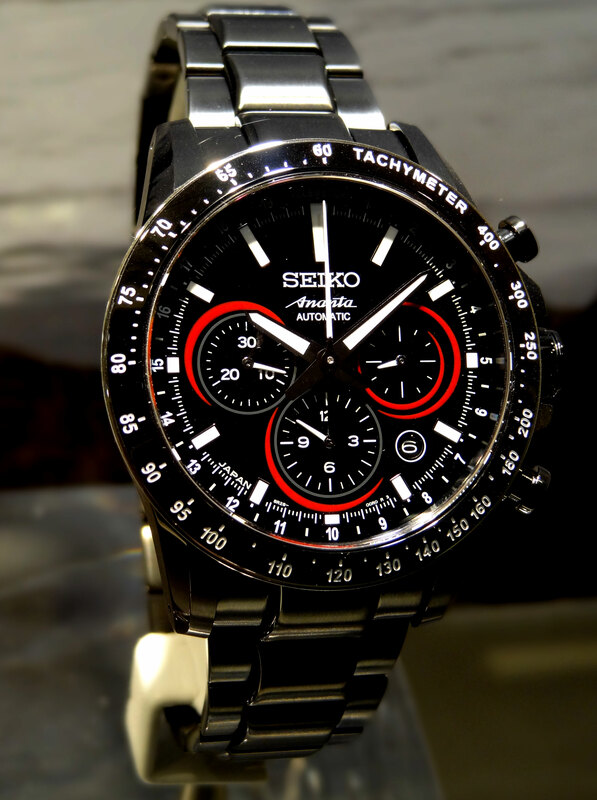 Seiko’s new releases also included a couple of new Ananta Limited Editions. They use the same Maki-e artist who did the SRQ013 dial (Isshu Tamura) to do the dials for these models. 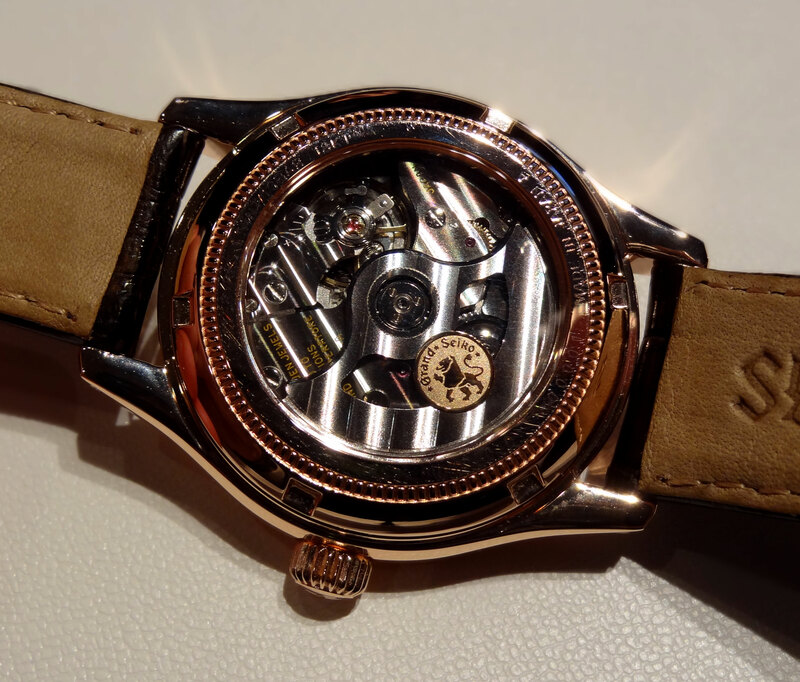 One utilizes the same 8R28 movement and is inspired by Japanese face painitng. The other has a new 6S28 (a variation of the 6S39 less the power reserve) that has a higher accuracy rating and square sub dials. Seiko Ananta SSD001 and SRQ015 (Kumadori) will deliver around October. 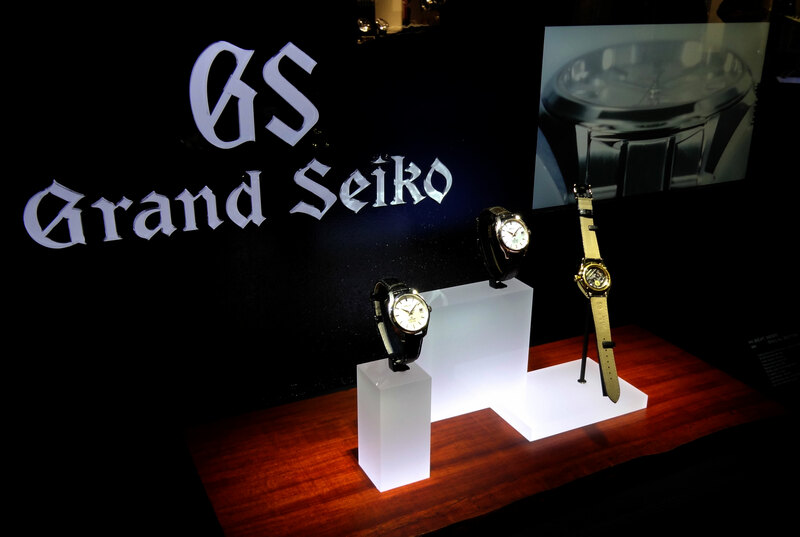 Grand Seiko has some tremendous new releases including 3 Hi-Beat SPECIAL models in 3 types of gold (white, yellow and rose) with an accuracy rating of +/- 2 to 4 sec a day. 1 second higher than the typical GS Standard. 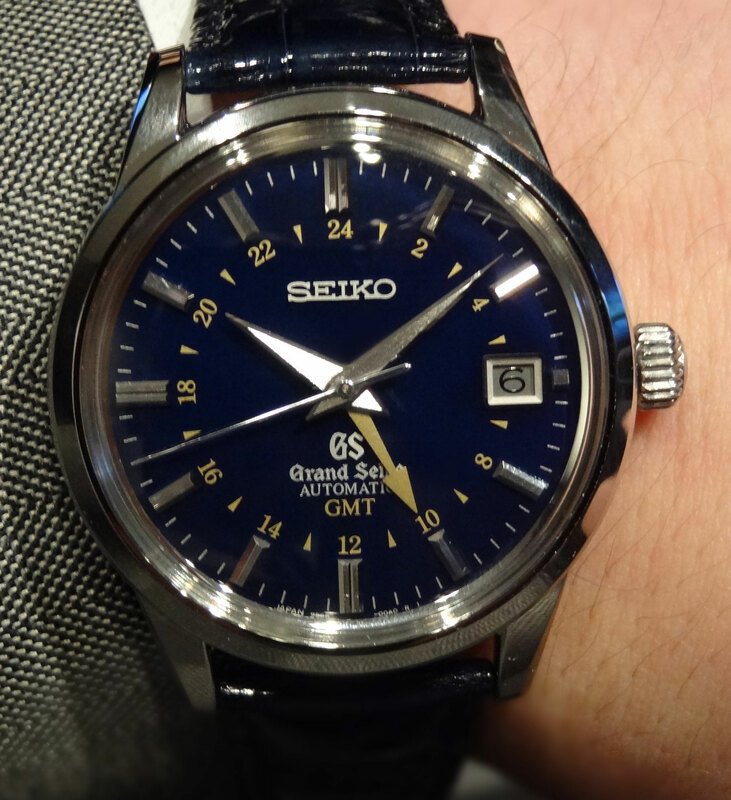 Grand Seiko Hi_beat Special SBGH019, SBGH020 and SBGH022 will deliver in October. The new GS GMT SBGE021 (green dial) is scheduled to arrive in a couple of weeks and looks far more impressive in person than any picture. 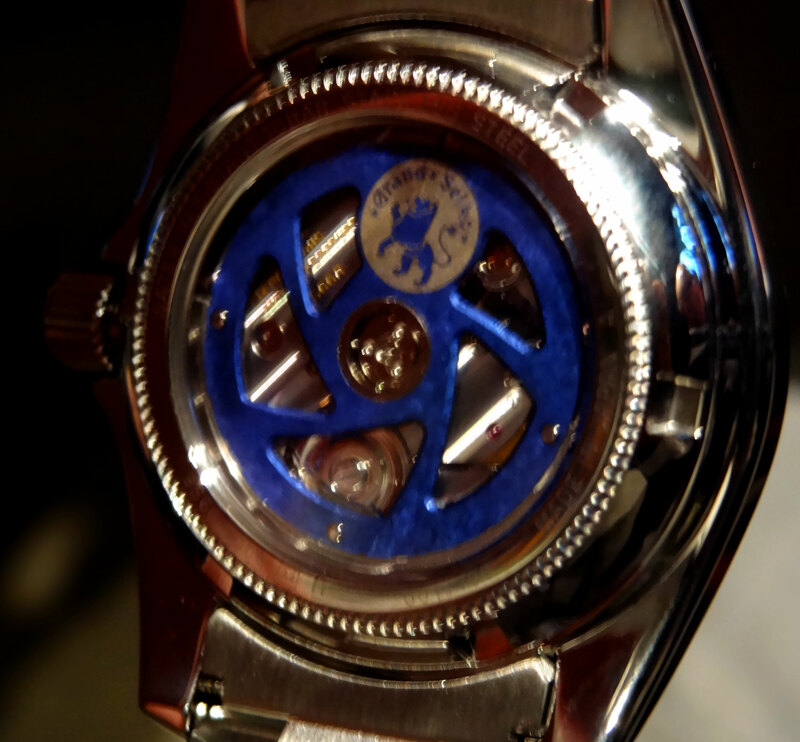 There is also 2 new blue mechanical GMT’s. 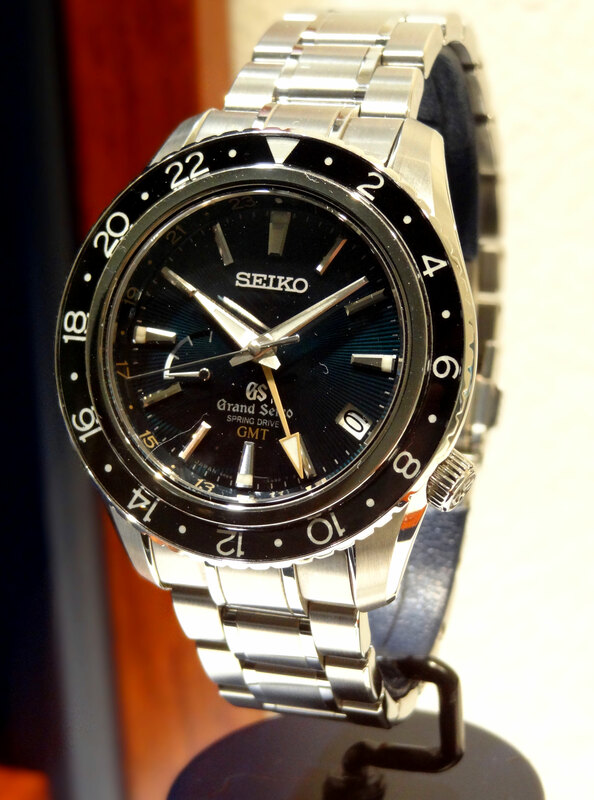 This year celebrates the 10th anniversary of the 1st GS GMT. 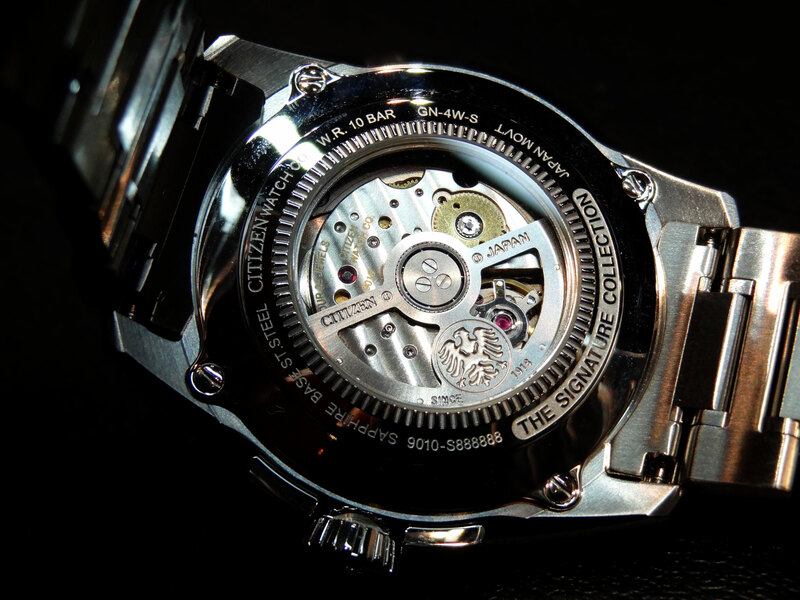 The rotors cover the whole movement and are made of titanium. The weight to swing the rotor is tungsten and can barely be seen through the display back. 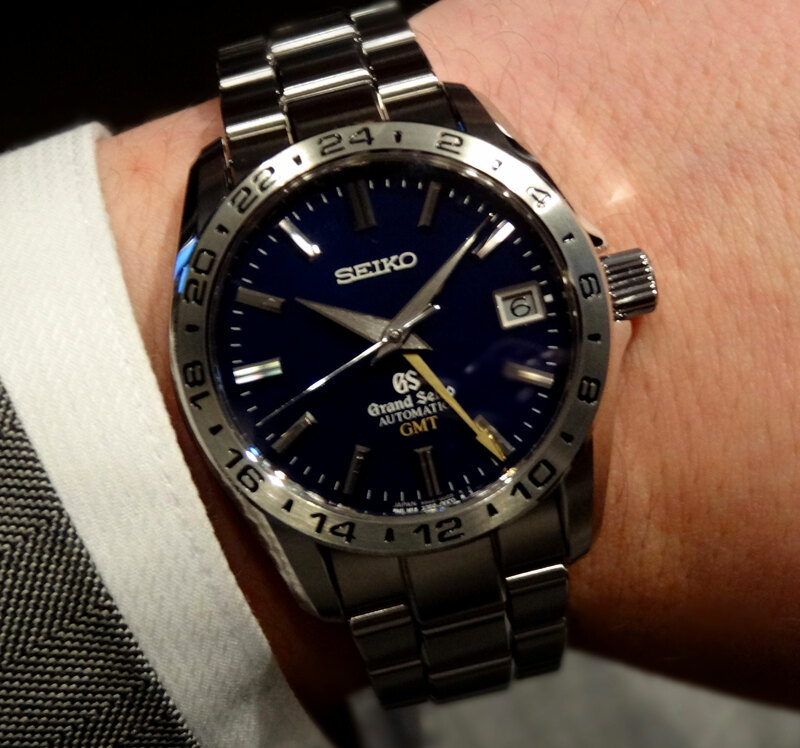 Both the Grand Seiko GMT SBGM029 and SBGM031 will deliver around October. 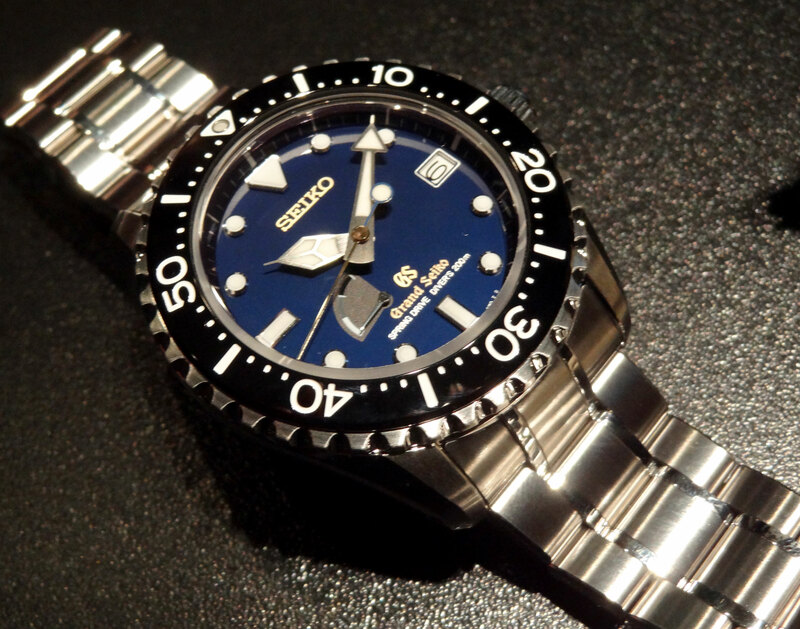 There is also a new release of a GS diver, limited to 150 with a blue dial and gold sec hand. The dial is truly beautiful and I’m sure they will sell out quickly. 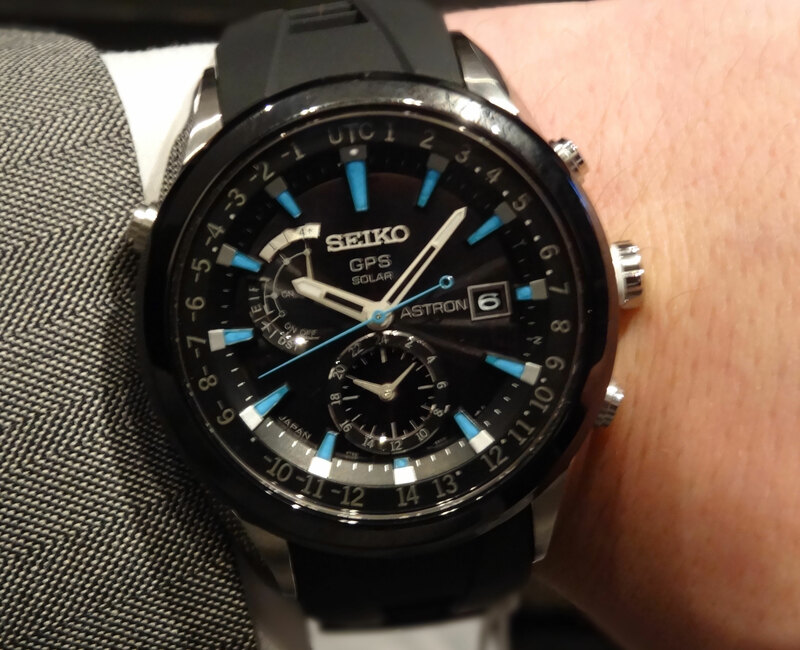 I hope you enjoyed the sneak peak at some of the great new things to come from Seiko this year. Please check out below for more pics!